Heavy-Duty 14 x 14 sq. inch weave Silver Tarpaulins. Durable for repeated and extended use. It is appropriate for extreme weather and jobsite conditions. Tarps provide the best UV protection: 100-Percent sun shading while the silver coating reflects UV rays. Ideal for: construction jobsites, roofing, painting, leaf/debris cleanup, camping, picnicking, hunting, canopy and tent fly. 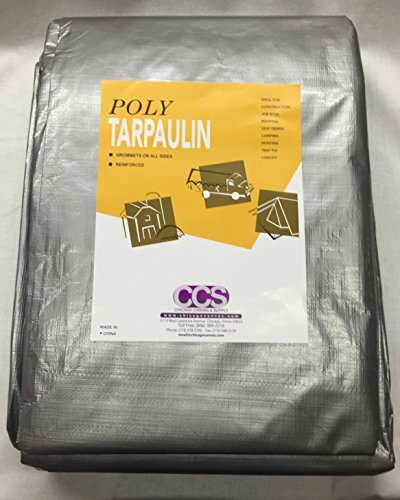 They are appropriate covers for equipment, boat, outdoor furniture, wood piles, or almost anything that needs protection for the weather elements. Also ideal for: construction jobs, roofing, painting, leaf/debris cleanup, camping, picnicking, hunting, canopy and tent fly. They are good covers for equipment, boat, outdoor furniture, wood piles, or anything that needs protection from the weather elements. Approx finish size 11'6" x 19'6"
View More In Structures & Hardware. If you have any questions about this product by CCS, contact us by completing and submitting the form below. If you are looking for a specif part number, please include it with your message.